Heartworm …prevention is easy, treatment is not! Home » Heartworm …prevention is easy, treatment is not! Tomorrow (June 1) is the start of heartworm prevention season here in Ontario – is your dog protected? 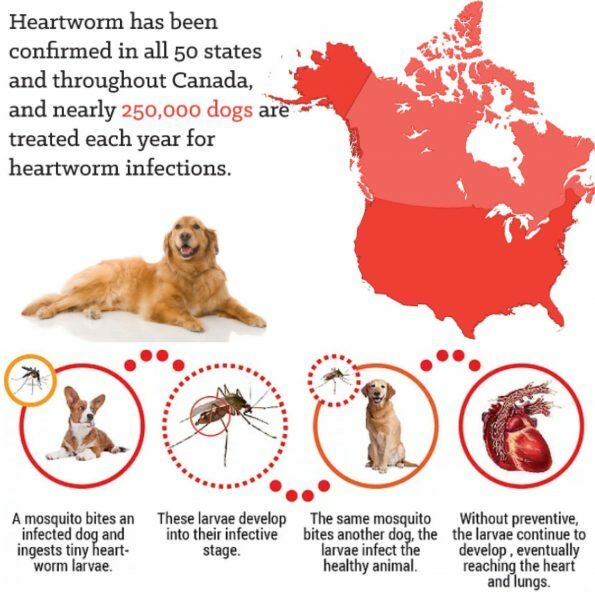 We’re lucky that heartworm is rarer here than in the US, but our sister clinic Bloorcourt has already seen several patients with heartworm this year, so it’s important not to become complacent! With that in mind…let’s learn about heartworm! Mosquitos are much more than a warm weather nuisance – they also transmit heartworm, which can cause heart failure. While testing and prevention programs have kept infection rates in Toronto low, that doesn’t mean that the threat has gone away. A significant percentage of the coyote population is infected with heartworm, and these wild dogs roam parks and ravines right here in our community. Heartworm is also very common in the United States (especially the southern states) and in tropical countries, and lucky rescue dogs starting a second chance life in Toronto may already be infected when they arrive. ‘Snowbird’ dogs who spent the winter in warmer climates can also inadvertently bring heartworm back to our city. If your dog gets a single bite from a mosquito that has bitten an infected dog, coyote, fox or other animal, that is enough to transmit heartworm. The good news though is that it is easily prevented, and can be treated if caught early. This is why we recommend that dogs get a heartworm test each year and use preventative medication from June to November, such as Revolution, which also protects against fleas. Revolution protects cats from heartworm disease as well, which is less common but can be even more deadly to our feline friends. Want to learn more? Give us a call or click here to book an appointment for your dog. If we’ve seen them within the past year and they are up to date on their exam and vaccines, their flea/tick/heartworm risk assessment appointment is FREE – you only pay for any lab tests and protection products you purchase, which are also available at discounted rates from our suppliers at this time of year!